About 70 people gathered at the Lothrop School in Pittsford Thursday night to winnow down a wish list: What to do with the old Forrest Farm, a historic house, barn and about twenty acres smack in the middle of town. Local residents Betsey and Baird Morgan bought the property last year for $187,000 to protect it from haphazard development. They renamed it the Village Farm and told town officials they wanted local residents to decide how best to use it. Eleven ideas, gathered at a public brainstorming session last month, were written on poster paper and affixed to the wall at this second meeting. The top three choices selected by Pittsford residents Thursday night at a public forum. A Working group will now figure out how best to implement the ideas. 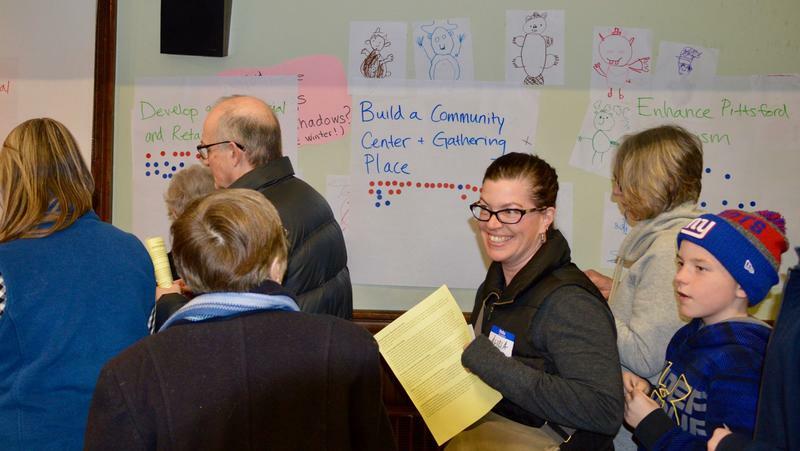 During two rounds of voting and discussion, moderated by staff from the Vermont Council on Rural Development, the top three ideas were selected and include: creating a community center, developing commercial and retail space, and forming an agricultural hub and community garden. Beth Saradarian lives close to the farm and is part of a working group that formed last year to help with the project. “I really appreciate the property’s views and open space and I want to retain the historical character of the property and use of the space for local citizens,” she said. Saradarian was one of many who voted for a community center. “So that people could have 80th birthday parties or baby showers or art displays indoors. We need that,” she added. Melanie Parker, who’s also part of the working group, nodded. She grew up in Pittsford, recently moved back. She's now the school nurse at Lothrop Elementary. Her top choice was creating a community gym and fitness center, which did not make the final cut. But Parker says she also believes Pittsford needs a community gathering place where everyone is welcome and has access and she’ll pitch in to help create it. Pittsford resident Laird Covey admitted he found it difficult to vote because he liked so many of the ideas. “But if we have a community center and gathering place, we could perhaps have some arts and culture displayed in that center,” he said alluding to an arts proposal that did not make the final three. Baird and Betsey Morgan purchased a historic house and farm in the center of Pittsford last year and have asked the community to decide what to do with it. Betsey Morgan says they wanted to protect the property from haphazard development and encourage a sense of community in their town. Betsey Morgan was equally thrilled. Local resident Marcy Covey says there is some concern in the community about how all of this will be paid for. “But I love the dreams are free stage,” she said laughing. Members of The Village Farm working group, which has been meeting for the last year on this project, will work with the Morgans to determine how best to implement the winning ideas.